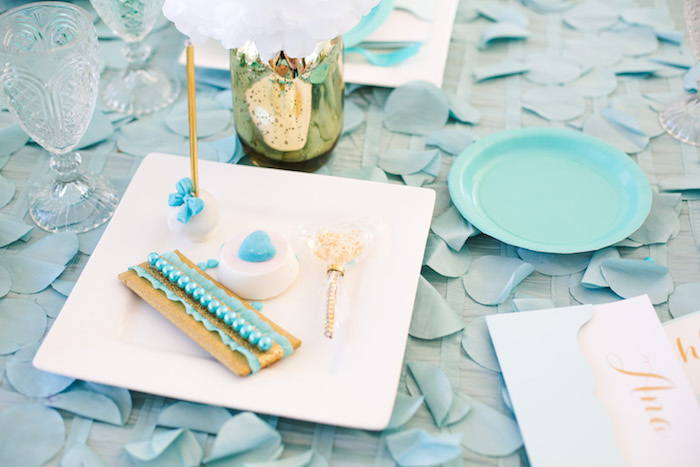 On the look out for something blue to make your heart woo? 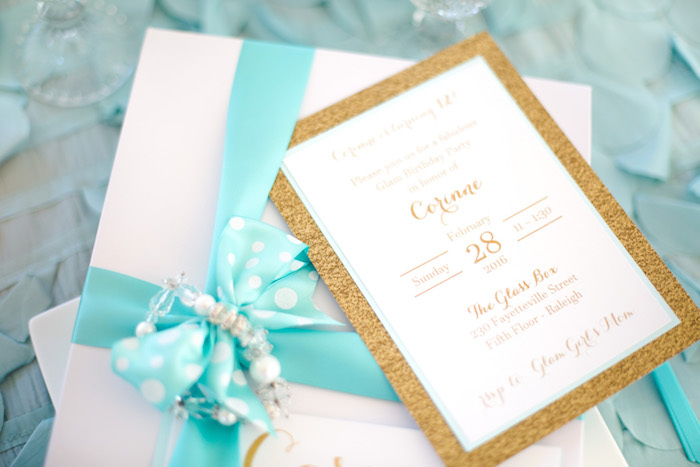 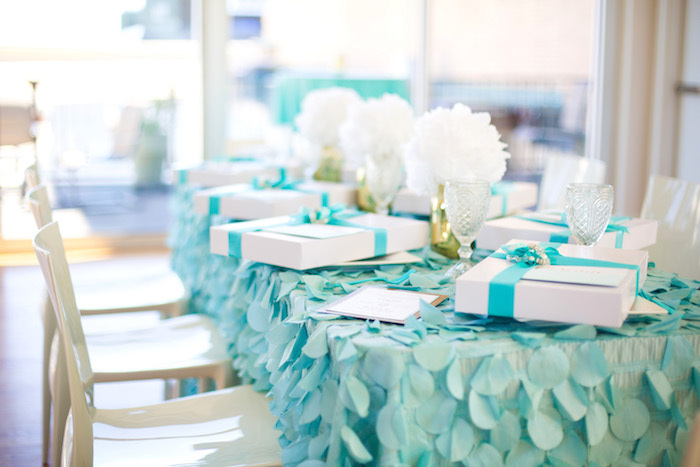 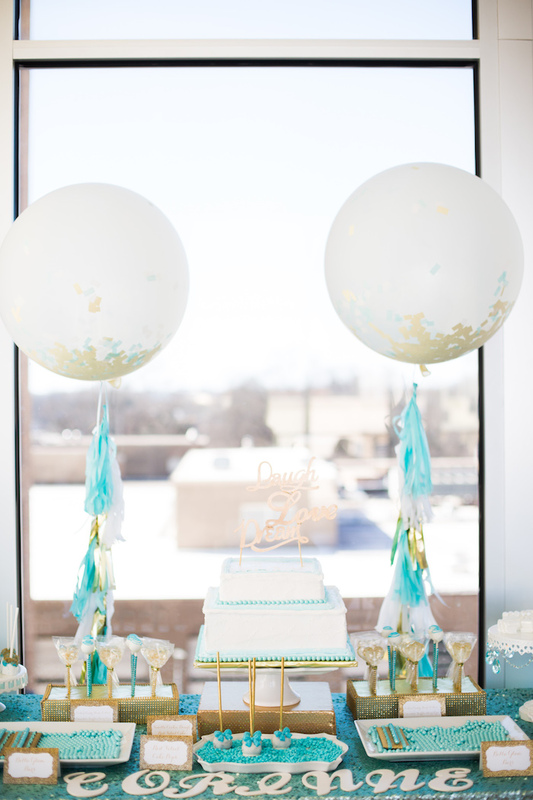 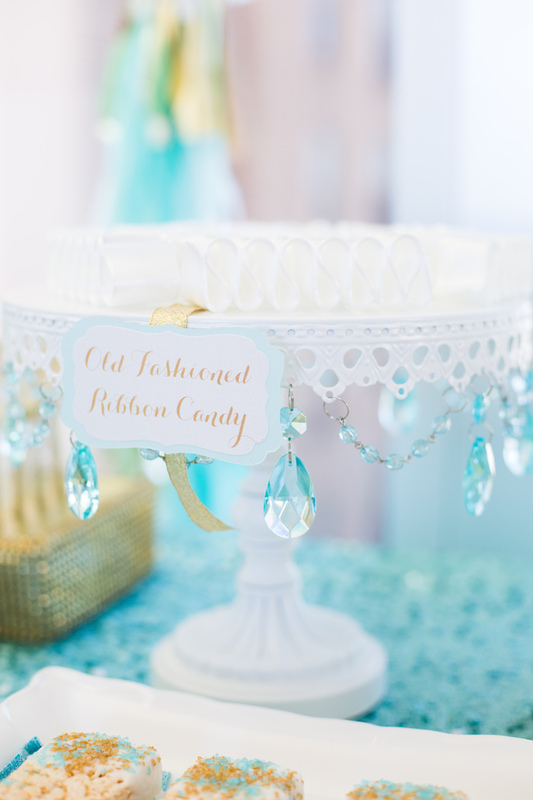 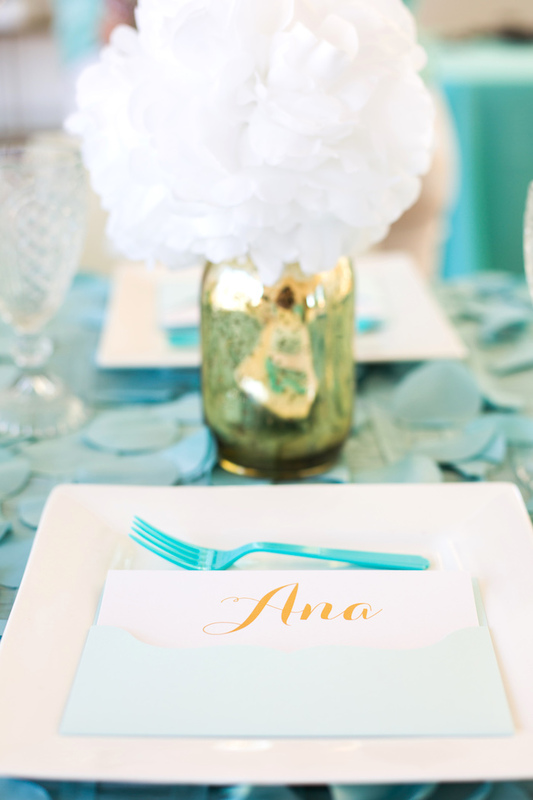 This Elegant Tiffany’s Inspired Birthday Party by Gina Myers of La Cosa Bella Events, out of Raleigh/ NC/ USA, will give you party ideas anew! 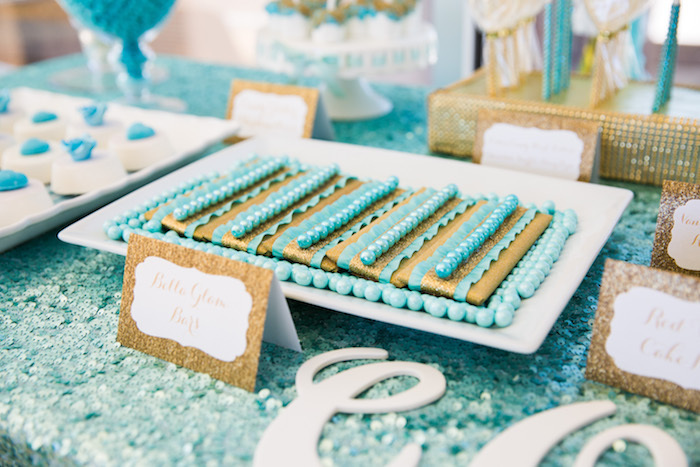 From the personalized t-shirts and favors to the gorgeous sweets, this birthday celebration is a delectable treat! 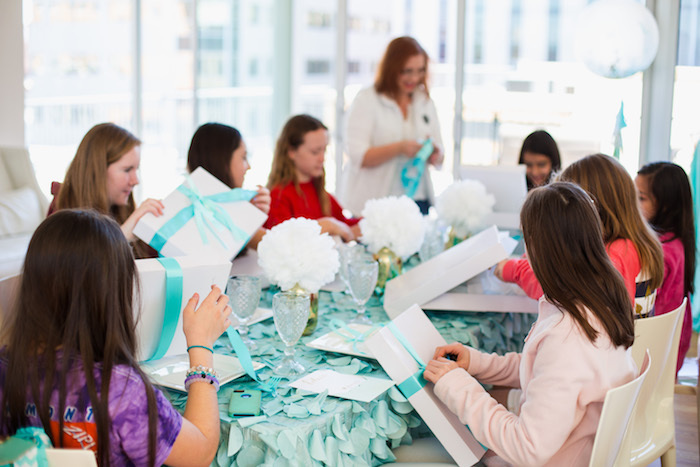 This is what Gina shared about the party- “When turning 12, what more could you want than to get your hair and nails done, hang out with your friends, and eat all of the dessert that you could ever want? 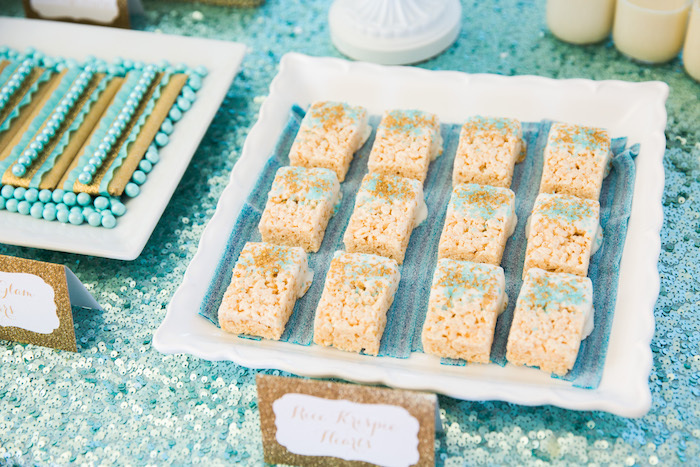 When your Mom is an event planner and is launching a dessert styling business, this is entirely possible. 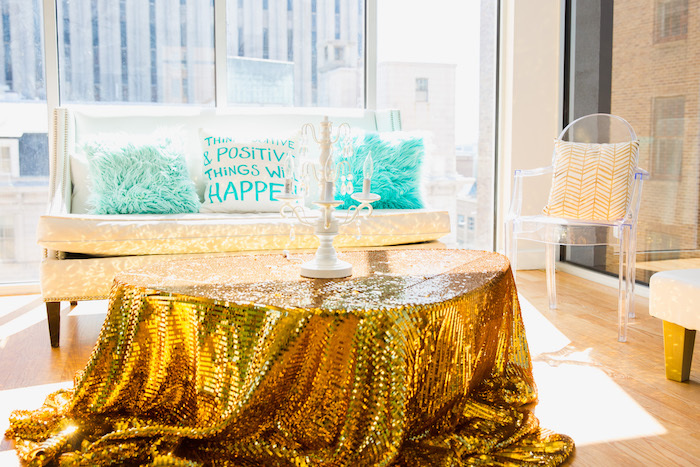 Corinne celebrated her 12th birthday party at The Glass Box in the heart of Downtown Raleigh. 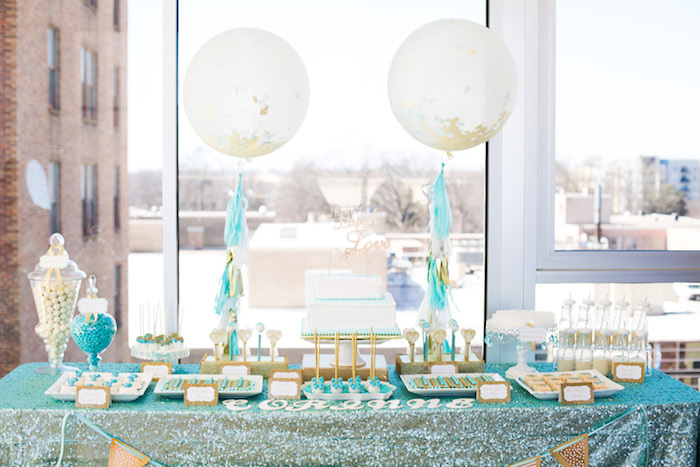 Did I mention that everything was Tiffany blue, white, and gold? 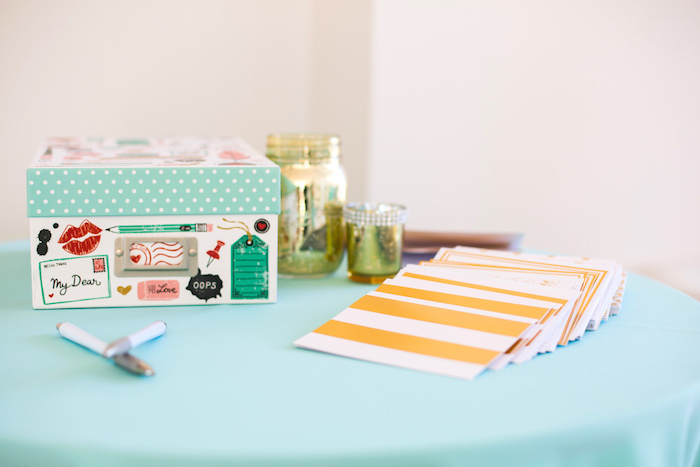 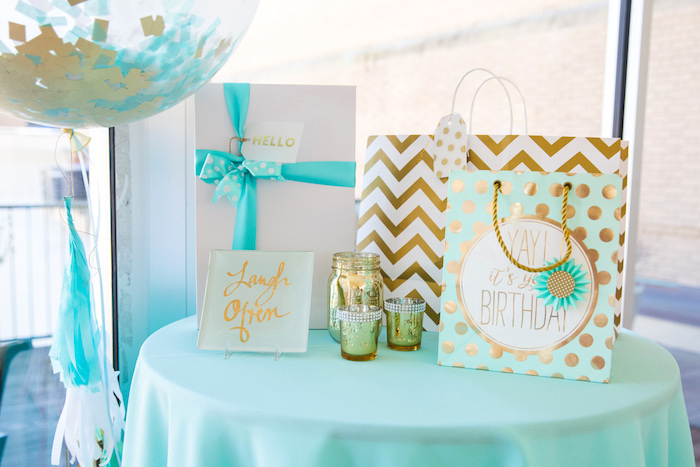 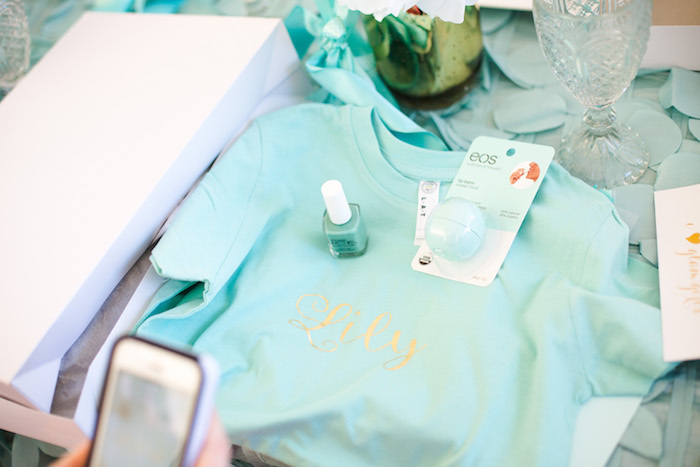 Upon arrival, the girls were given a favor box complete with custom name card, personalized Tiffany blue shirt, Tiffany blue and white nail polish, and a Tiffany blue Eos chap stick. 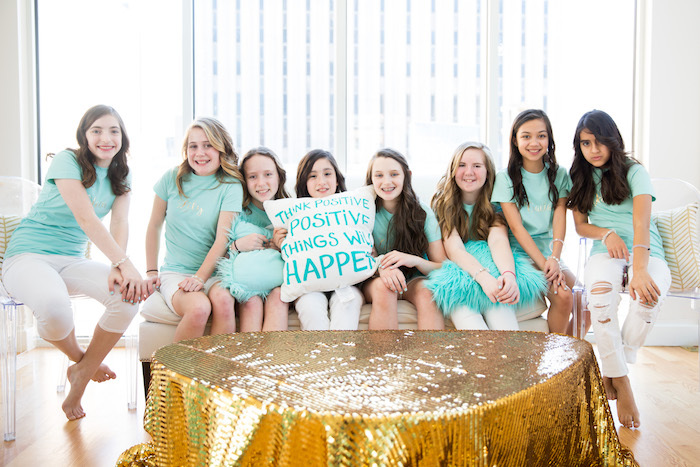 The girls changed into their matching tshirts and it was time to get the party started! 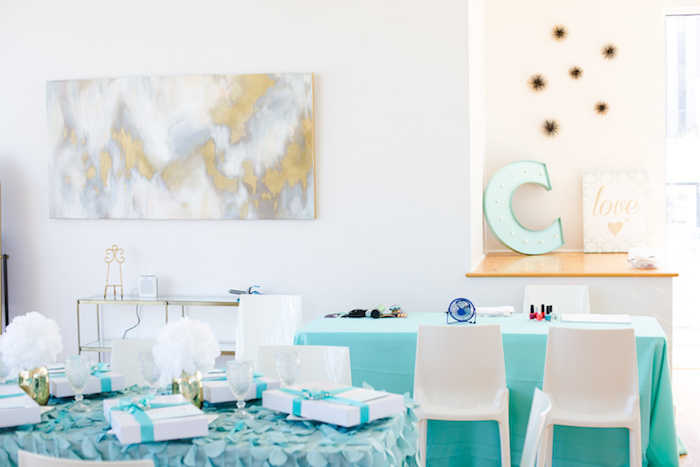 Corinnes friends were in awe, Snap-chatting and Instagramming every part of the bash! 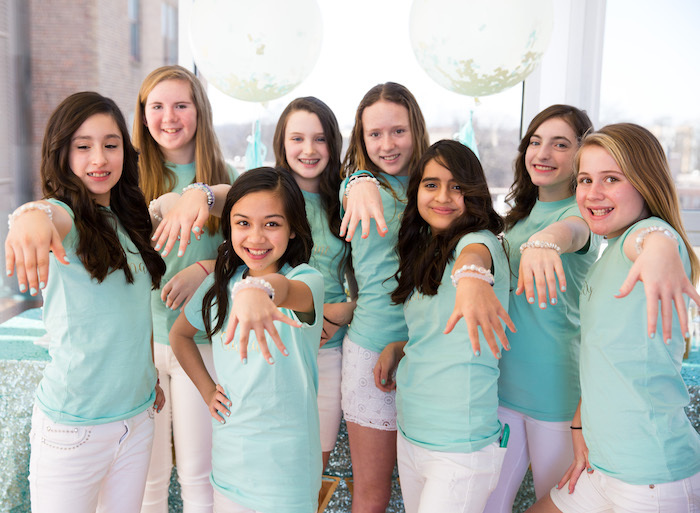 The girls giggled and took selfies while they took turns getting their hair curled and their nails painted Tiffany blue. 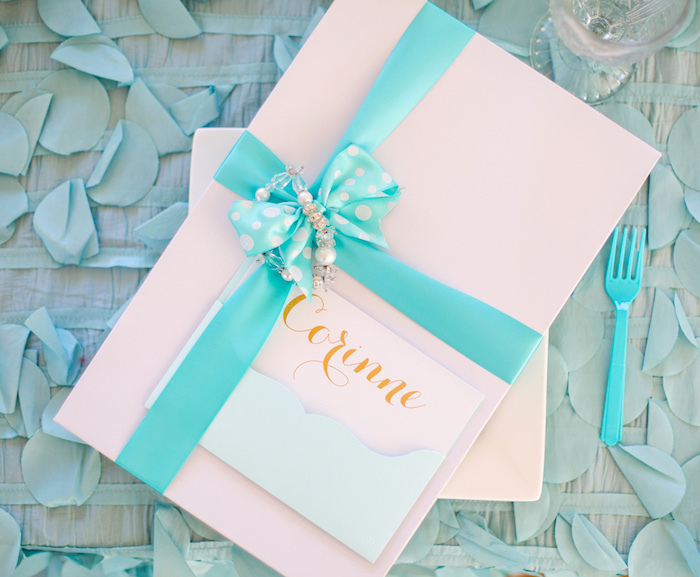 They also wrote letters to Corinne and put them in her memory box for her to open the following year on her 13th birthday! 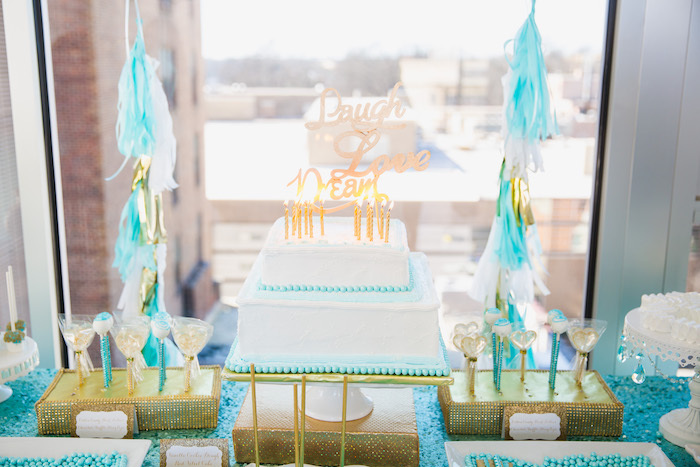 The natural light in The Glass Box makes everything bright and cheery and this was the perfect mood for this super fun glam birthday dessert party! 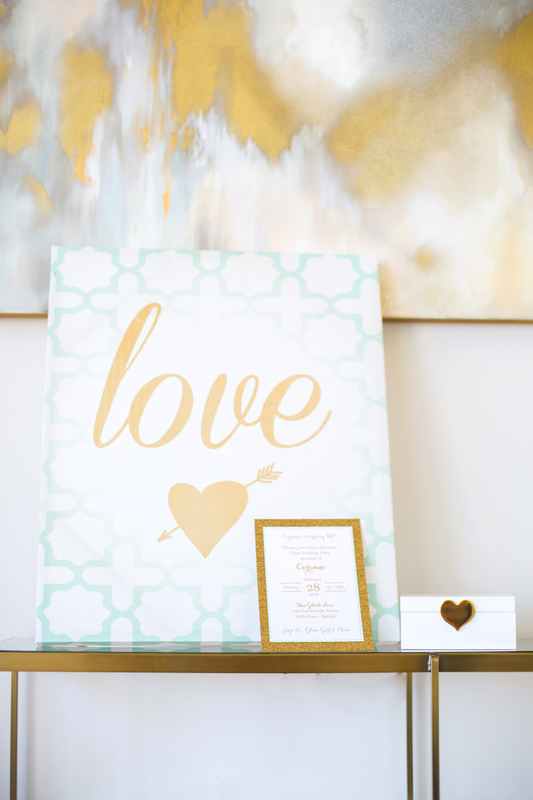 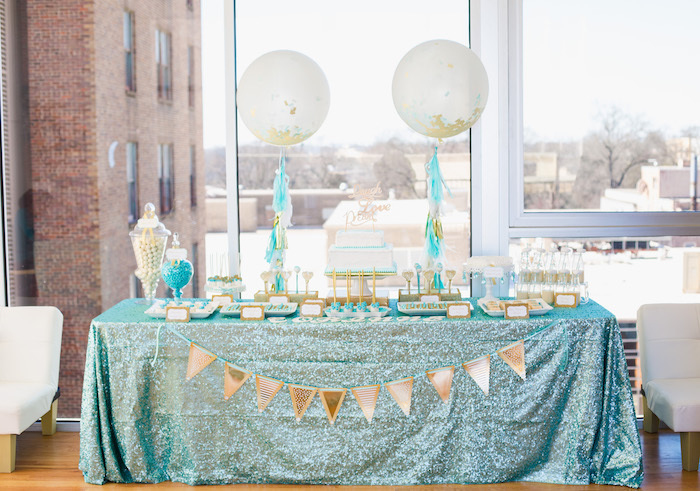 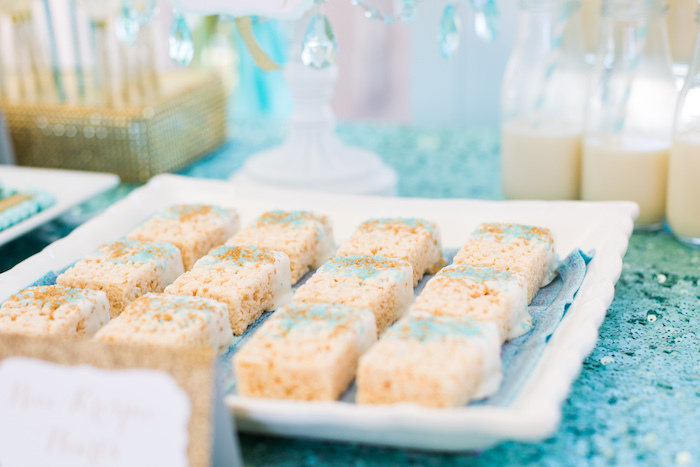 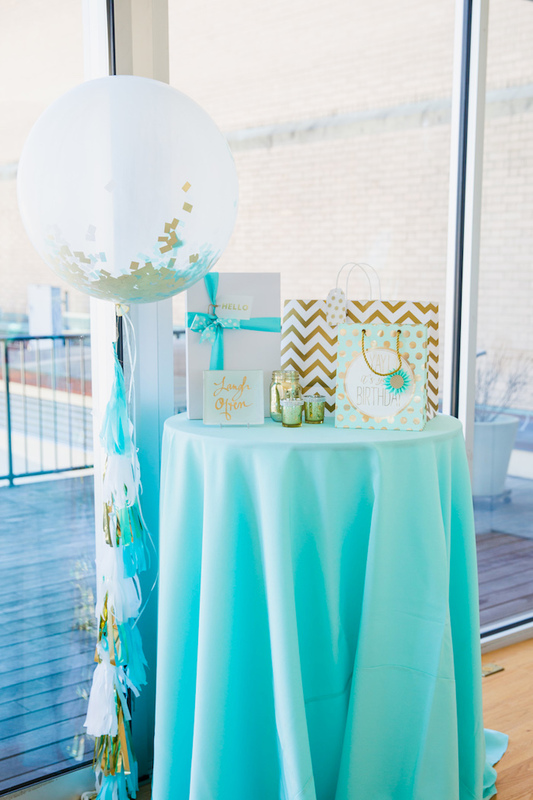 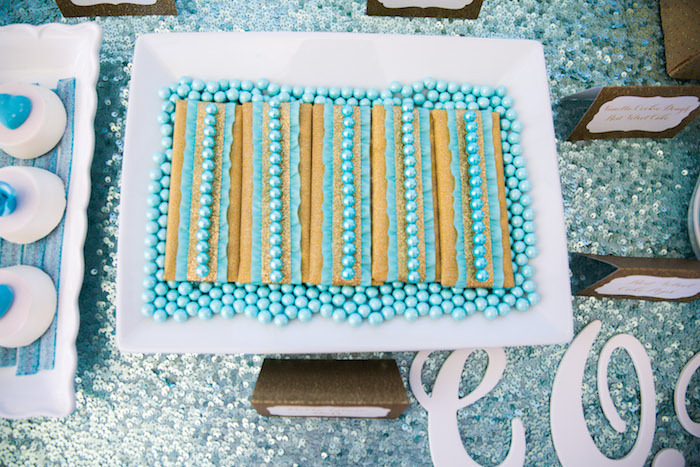 The sunlight glistened on the Tiffany blue sequin linen that covered the gorgeous dessert table and a metallic gold linen covered the lounge coffee table. 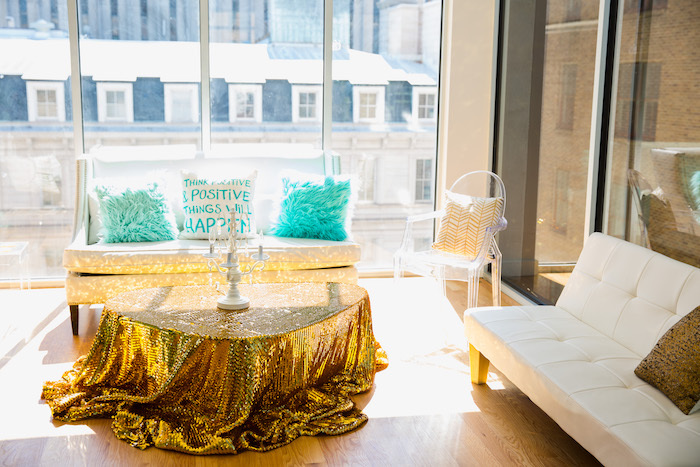 The white couches were decorated with assorted throw pillows to add a personalized touch. 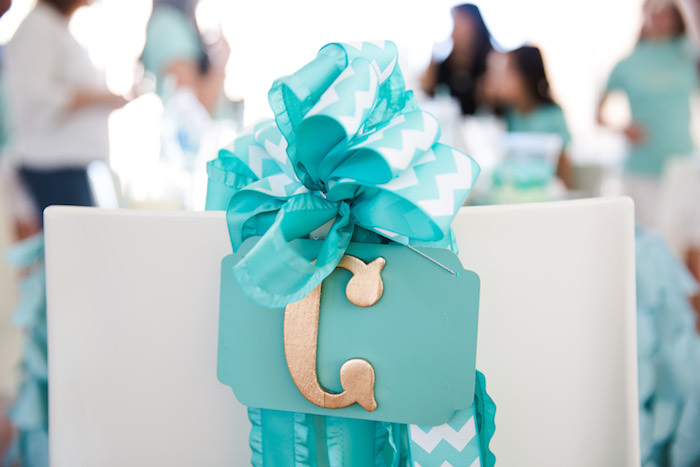 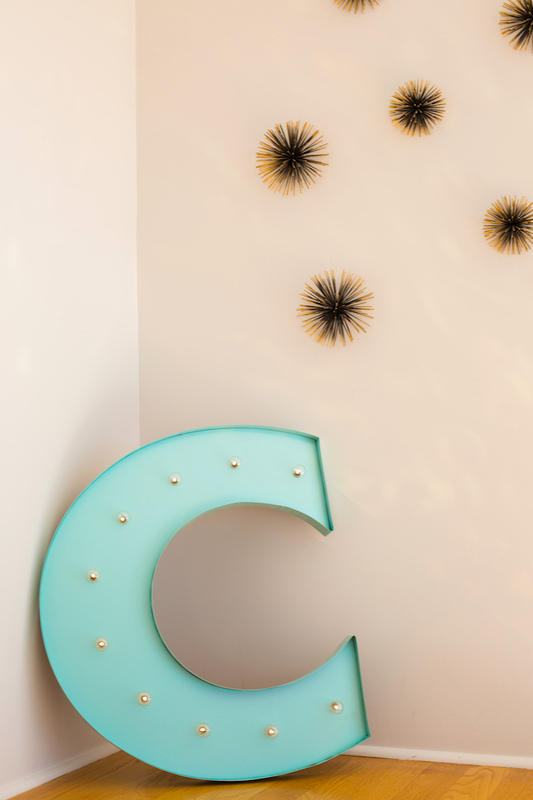 There was even a giant C marquee light in Tiffany blue to highlight the birthday girl! 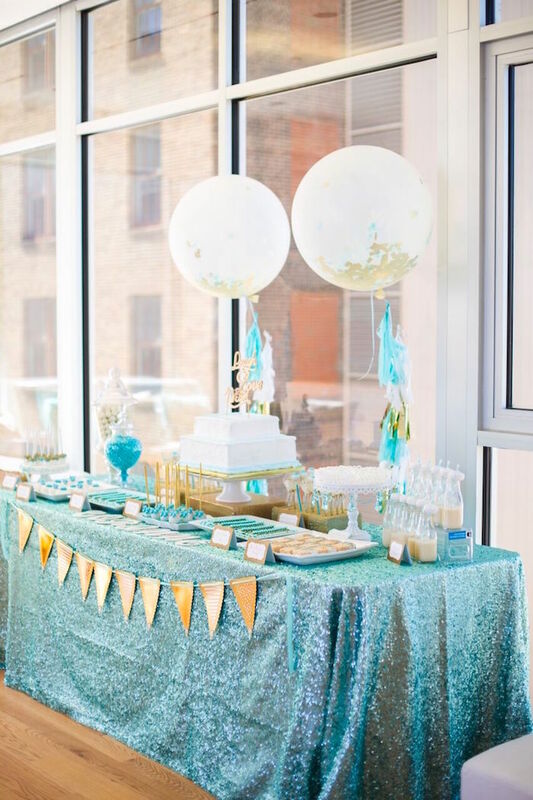 The dessert table was the star of the show, besides Corinne of course. 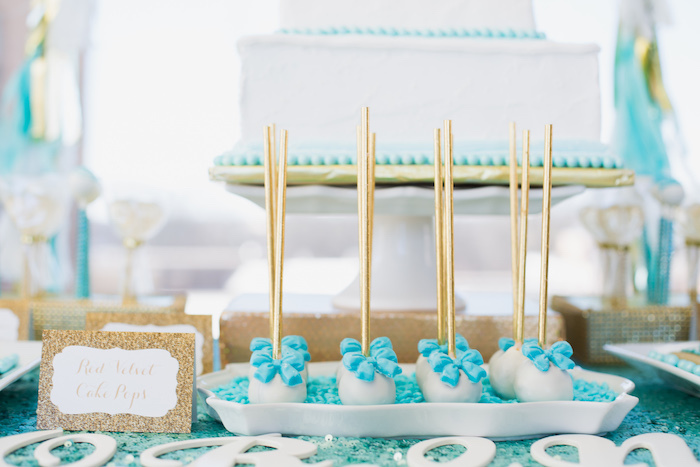 It was complete with chocolate covered everything. 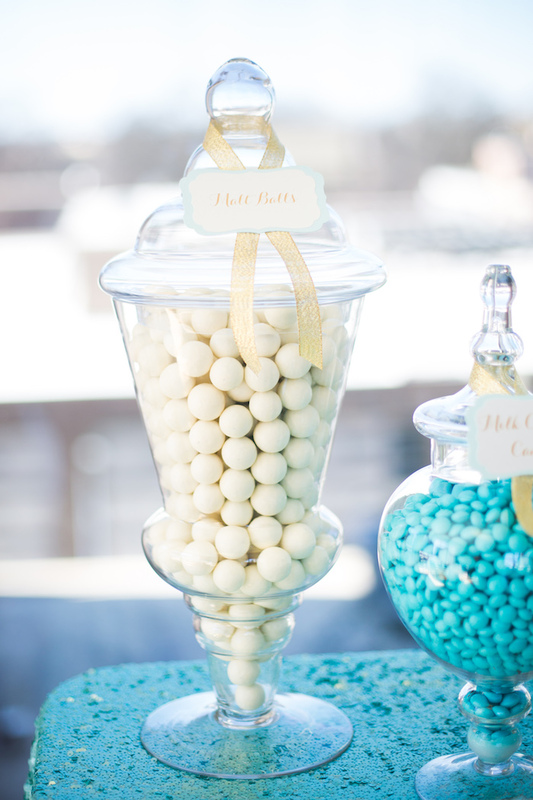 From marshmallows and Oreos to malt balls and cake pops. 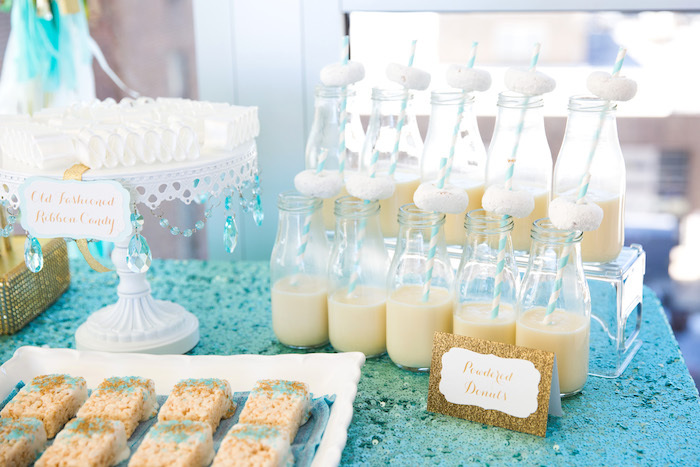 There was also classic ribbon candy, candy coated chocolate, and powder sugar donuts on a straw in a classic milk bottle. 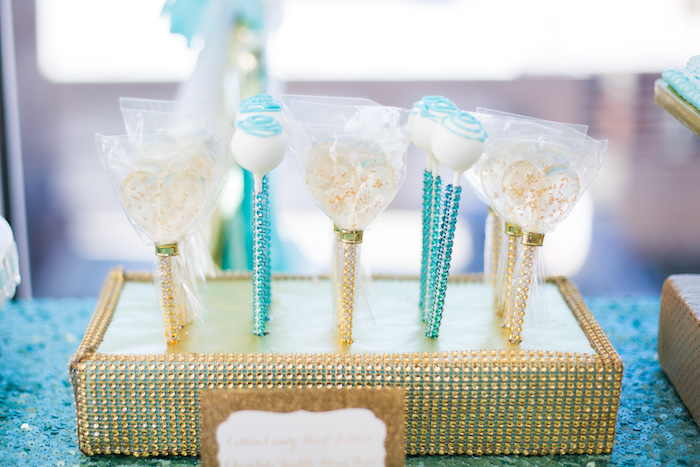 Bella Sweet Styling also included their signature Bella Glam Bars, which are wrapped, decorated chocolate bars, and their Bella Glam Pops, which are their signature cake and chocolate pops. 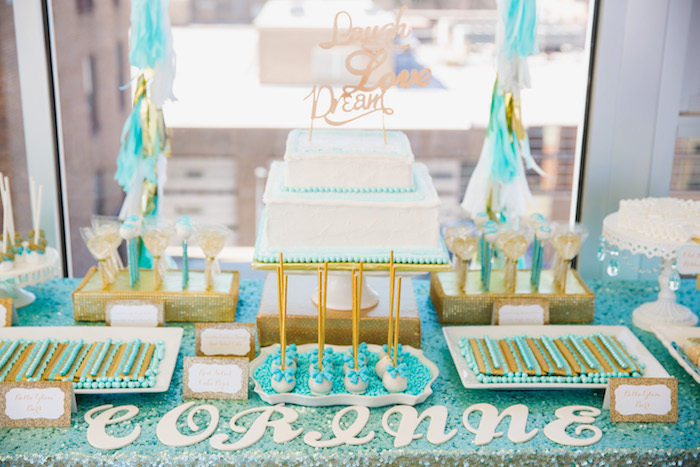 Corinne blew out the candles on her cake and it was time to devour the sweets! 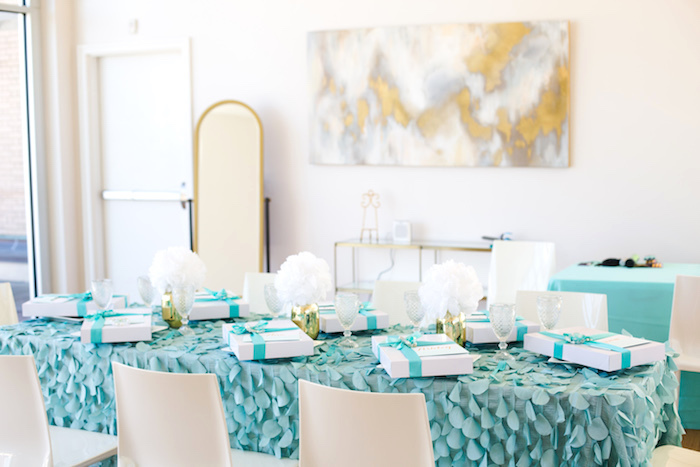 While presents were appreciated, it was the fun quality time with her friends that mattered the most. 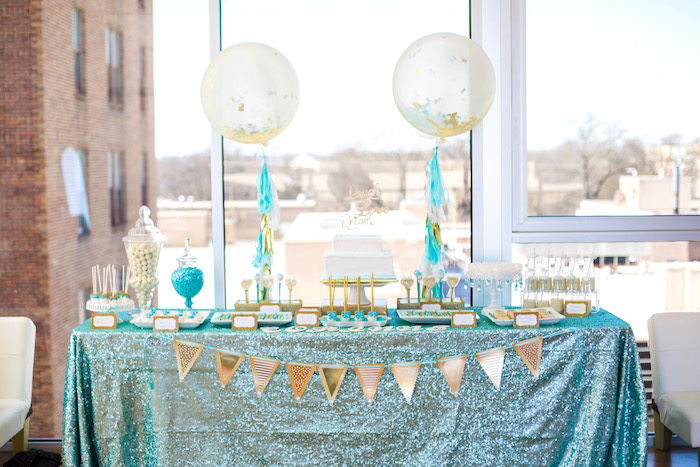 Tween parties aren’t always the easiest to pull off, but La Cosa Bella Events loves to plan parties for all ages. 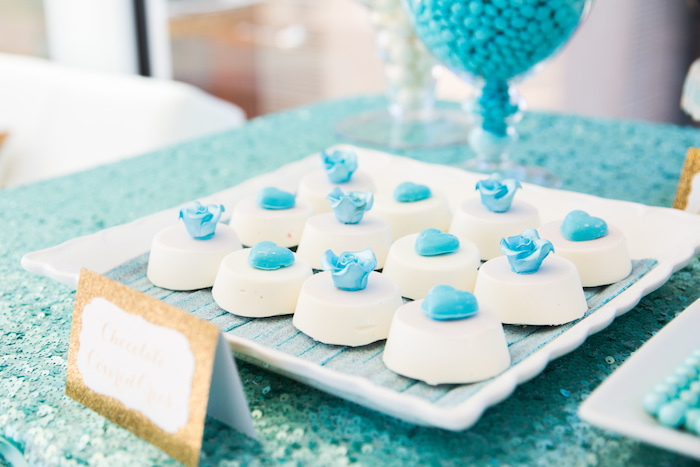 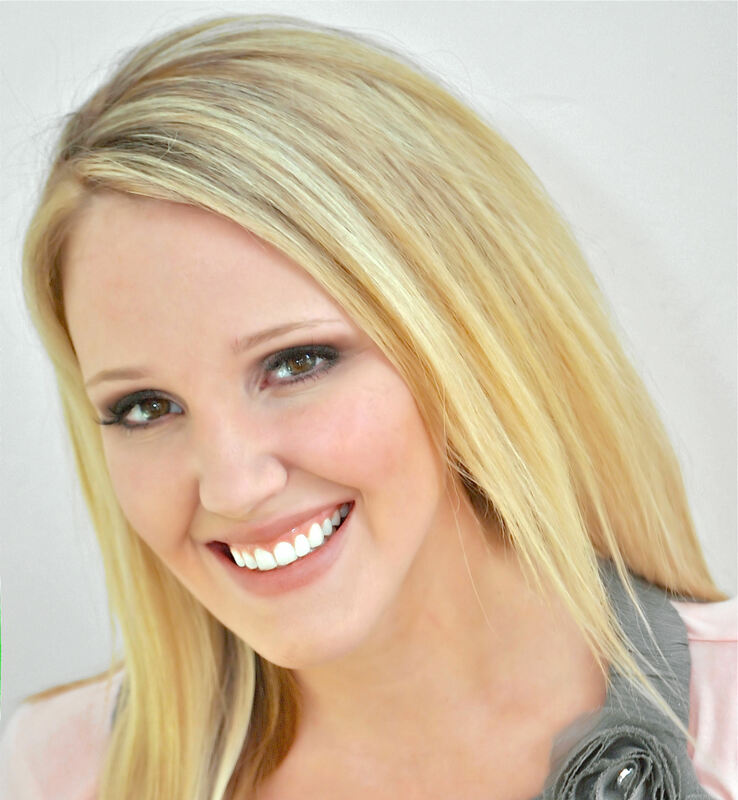 Bella Sweet Styling is the perfect part of La Cosa Bella for those parents and kids that want a personalized special event experience”.